The Before It’s Too Late Conservation Community is a Not For Profit initiative of Storyteller Digital Limited and is dedicated to providing the following support to the work of individuals and organisations involved in preserving planet Earth’s biodiversity. Ben Cropp Productions and others. and have a website, then we invite you to, please join us, so we can help each other, save this planet’s biodiversity, before it’s too late. It costs nothing to join and we all have much to gain. 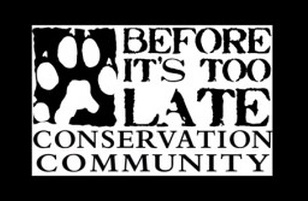 To become a Monetised Symbiosis Member of the Before It’s Too Late Conservation Community – click the BITLCC logo below. Watch the videos. Each time a video is played for more than 30 seconds Before It’s Too Late receives part of the advertising revenue, so does the conservation organisation if you are viewing clips from their sites. If you buy any BITLCC branded product from a member’s online or physical shop, 30% of every sale stays with the conservation organisation of your choice.